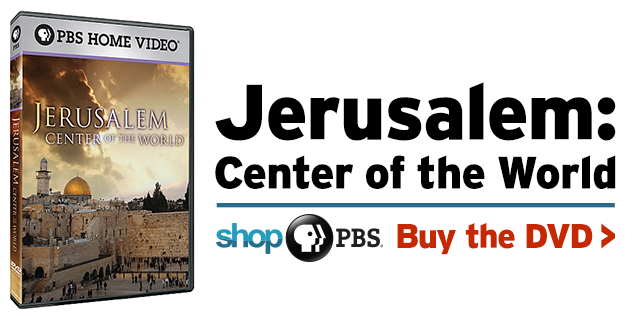 Jerusalem: Center of the World re-aired December 1, 2015. Jerusalem tells the story of the fascinating city so many people have loved and died for. For over 40 centuries, untold numbers of Jews, Christians and Muslims have come to Jerusalem to look for God, while billions more have worshiped from afar. Jerusalem: Center of the World, a two-hour epic event in Hi-Definition by Emmy Award-winning producer/director Andrew Goldberg and Oregon Public Television, is the first documentary of this scope to delve into the historical facts and religious beliefs that have led so many thousands to live and die for this city. 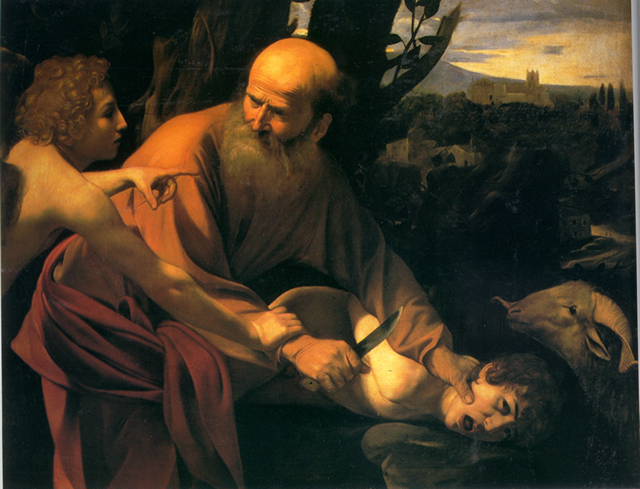 Abraham nearly sacrifices his son Isaac on Mount Moriah in Jerusalem in Caravaggio's "The Sacrifice of Isaac." Host Ray Suarez of The NewsHour With Jim Lehrer, together with an outstanding roster of scholars, explores the founding of the city, and the birth and convergence of the world's three major monotheistic religions. He lends voice to the key events in the city's history as described in the Hebrew and Christian Bibles, the Talmud, the Hagaddah, the Koran, and the Hadith. The film takes viewers far beyond the city's exteriors to follow the paths taken by Abraham, David, Jesus, and Mohammed, among countless others. From a strikingly intimate perspective, Suarez travels deep into the city. He touches the walls of Hezekiah's famed underground water-filled tunnels built over 2500 years ago; he faces the same wall the Biblical King David likely faced when conquering the city in the 10th century B.C.E. Suarez also visits the recently discovered Siloam pool where Jesus, it is said, cured a man's blindness, and he takes us right into the Dome of the Rock from where Mohammed, Muslims believe, ascended to Heaven. With illustrations from over 300 pieces of iconic artwork, Jerusalem: Center of the World brings one of the oldest cities in the world to life. Mount Moriah, site of the First and Second Temples: At the center and beginning of it all, this 60' x 40' piece of Rock is where, according to the Bible, Abraham was instructed by God to sacrifice his son. The Rock was later enshrined by David's son, King Solomon, and became the site of the First Temple. Church of the Holy Sepulcher: One of the holiest and most visually amazing churches in all of Christianity, it was built to enshrine the collective sites of Jesus' crucifixion, burial and ascension to Heaven. Dome of the Rock: Built over the Rock, this Islamic shrine is among the oldest extant Islamic buildings in the world, and is considered by many to be the most stunning. It is from here that Muslims believe the Prophet Mohammed ascended to Heaven. The Western Wall: Dating from roughly 2,000 years ago, King Herod the Great, ruler of Jerusalem, built vast retaining walls around Mount Moriah where the Second Temple stood. Virtually all was destroyed when the Romans sacked Jerusalem in 70 C.E., but the Wall remains and is considered the holiest site in the world for the Jewish people. Two Cats Productions is the producer of Anti-Semitism in the 21st Century (2007, PBS), The Armenian Genocide (2006, PBS), the Emmy Award-winning, A Yiddish World Remembered (2002, PBS) and Proud to Serve: The Men and Women of the U.S. Army (American Public Television, 2003). Andrew Goldberg is Executive Producer and Director. Oregon Public Broadcasting is one of the nation's top producers and presenters of public television programming, including primetime series, national news features, travel shows, historical documentaries, and specials that address contemporary issues. Two Cats Productions and Oregon Public Broadcasting. © 2015 Two Cats Productions, LTD. All Rights Reserved. Text by Andrew Goldberg. Photos courtesy of Two Cats Productions.